Chelsea are keeping tabs on Mario Balotelli’s availability as his rocky relationship with AC Milan continues to deteriorate. Balotelli is increasingly unhappy at San Siro following a nightmare first half of the season which has left the Rossoneri in 13th place in Serie A, 27 points behind leaders Juventus. AC Milan’s terrible domestic season so far is pushing Balotelli closer to the exit door. However, this scenario seems very unlikely to be played out in January, for many reasons. First of all, Balotelli’s market value is currently pretty low and AC Milan are not able to ask for more than €25-30m. Also, AC Milan and Chelsea are both in the Champions League, so a possible move during the winter transfer window would end Balotelli’s season in Europe. It is true that president Silvio Berlusconi does not like the forward and his behaviour but he is also aware that the player should be kept at least until after the World Cup. If he performs well in Brazil, he would demand a higher fee and AC Milan could try to engineer a possible Gareth Bale-like transfer. The former Manchester City striker is known to be unimpressed with the lack of investment in the squad since he joined for around €22 million in January of last year, even though Kaka was brought back from Real Madrid during the summer and Keisuke Honda and Adil Rami have been recruited this winter. The striker’s agent, Mino Raiola, has alerted clubs to his client’s situation as they explore the player’s options – and Chelsea manager Jose Mourinho, keen on bolstering his striker options during January, has asked to be kept informed of the situation. The Blues were keen on making a move for Wayne Rooney during the summer only to be met with resistance from Manchester United, while they have also been linked with a move for Napoli’s Gonzalo Higuain in recent days – though Mourinho played down talk of a deal for the Argentine to reporters on Friday. And despite claims of a falling out between Mourinho and Balotelli during their time at Inter, the Portuguese remains a big fan of the Italy international. The Blues will likely have to sell to buy this winter given their €59m loss over the most recent financial year but could be tempted into a move should they sell either, or both, of David Luiz and Juan Mata. However, despite Balotelli’s unhappiness and some ill-feeling towards the Italy international among the club’s board, a January move appears unlikely. Milan president Silvio Berlusconi has never been enamoured by Balotelli’s behaviour and would sanction a sale, a decision driven at least in part by the delicate political situation at the Giuseppe Meazza following the appointment of Berlusconi’s daughter, Barbara, to the club’s board. Adriano Galliani, who looked set to step down as CEO at the end of November before performing a U-turn and agreeing to share general manager duties with Babara Berlusconi, was responsible for bringing the 23-year-old to Italy 12 months ago. Galliani’s power at Milan is at an all-time low, however, and the Berlusconis are pushing for a sale in the right conditions. But such conditions appear unlikely in the coming weeks. 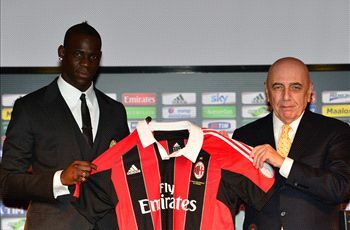 Balotelli is the biggest star in the Milan ranks and the club would want a mammoth transfer fee for the Italy striker. Given his below-par displays this season, however, the Italian giants would be unable to demand anything more than €25-30m for his services at this moment in time and any sale for that amount would likely cause uproar among an already dissatisfied fanbase. As such, the club are prepared to wait until after the World Cup in the hope that Balotelli impresses for his country in a bid to drive up their asking price.